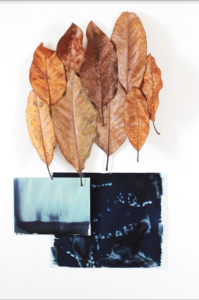 COOP Gallery is pleased to present “Material Passage,” an exhibition of multidisciplinary work by the gallery’s newest members, TIna Gionis and Alexandra Jo Sutton. Each year COOP invites local and newly transplanted artists to join its ranks in recognition of the seriousness of their work and their significant contributions to Nashville’s artist community. This year’s show is indicative of the diverse range of media and conceptual approaches that contemporary artists engage with, and exemplifies COOP’s commitment to the greater visual arts dialogue within our local community. Alexandra Jo Sutton’s series of sculptures and 3D collages, or “Ritual Documents,” use a combination of material approaches to explore the significance of ritual in re- constructing memory over a period of time. She uses natural artifacts like magnolia leaves and time-based cyanotype photography practices, along with sewing as a repetitive construction technique. The process of the series’ creation acts as a ritual reflecting the psychological effort of recalling and re-building a memory. The works create textured visual experiences that speak to the overlay of time, material, absence, and meaning. Tina Gionis’s images are part of a series titled “City-Nashville.” This body of work investigates a city that is experiencing fast growth while trying to maintain its character in the face of this transition. Tina Gionis is a Nashville-based artist working primarily with photography and video. She received her BA in Creative Writing and Psychology from the University of Toledo. After graduating, she spent ten years in Asia working as a travel photographer and ESL Writer. After repatriating to the States, she received a certificate in Documentary Photography from the International Center of Photography in NYC and an MFA in Digital Arts from Bowling Green State University. Alexandra Jo Sutton received her MFA degree in studio art from the Pennsylvania Academy of the Fine Arts. Her work includes sculpture, experimental photography, installation, and video. Centering on memory, time, nature, and the body, her work involves a sensitivity to materials and includes experimental practices from growing crystals to body casting. Alexandra has recently had noteworthy exhibitions at Mixed Greens Gallery in Chelsea, NYC and Marginal Utility in Philadelphia, PA. She is originally from the small town of Clanton, Alabama where she grew up eating peaches and loving animals. She lived in Philadelphia for four years while earning her MFA and working in arts administration. Now, she lives in Nashville, TN, with her four cats. She is a member of Coop Gallery, and teaches studio art/art history at Belmont University and Austin Peay State University.